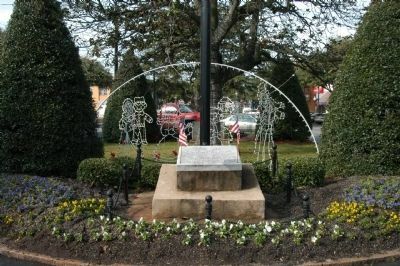 Erected by American Legion Post 24. Location. 35° 20.016′ N, 81° 51.853′ W. Marker is in Forest City, North Carolina, in Rutherford County. Marker is on E. Main Street 0.1 miles east of Mill Street, in the median. Touch for map. Marker is in this post office area: Forest City NC 28043, United States of America. Touch for directions. Other nearby markers. At least 8 other markers are within 6 miles of this marker, measured as the crow flies. Police Memorial (within shouting distance of this marker); Forest City Confederate Memorial (about 300 feet away, measured in a direct line); Town of Burnt Chimney (about 500 feet away); Elisha Baxter (about 800 feet away); Forest City (approx. 0.2 miles away); First Baptist Church (approx. ¼ mile away); Old Cool Springs Cemetery (approx. 0.7 miles away); Rev. James Milton Webb (approx. 5.6 miles away). Touch for a list and map of all markers in Forest City. More. 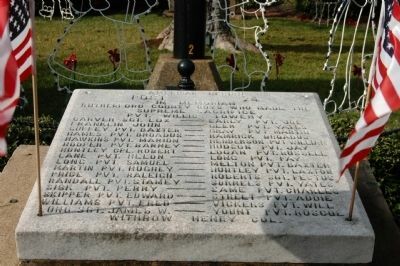 Search the internet for Rutherford County Memorial. Credits. This page was last revised on June 16, 2016. This page originally submitted on December 21, 2008, by Michael Sean Nix of Spartanburg, South Carolina. This page has been viewed 790 times since then and 5 times this year. Photos: 1, 2. submitted on December 21, 2008, by Michael Sean Nix of Spartanburg, South Carolina. • Bill Pfingsten was the editor who published this page.